A file photo of a SpaceX Falcon 9 rocket atop Launch Pad 39A of NASA's Kennedy Space Center in Florida. SpaceX will launch the secret Zuma mission for the U.S. government on Nov. 16, 2017. A SpaceX Falcon 9 rocket will launch what just might be the company's most mysterious payload yet tonight (Nov. 16) — the secret Zuma mission for the U.S. government — and you can watch it live online. You can watch the Zuma launch live, courtesy of SpaceX, beginning about 15 minutes before liftoff (7:45 p.m. EST for an 8 p.m. EST launch target). You can also watch it directly from SpaceX's live webcast page here. If SpaceX is unable to launch the Zuma mission Thursday night, the company does have a backup launch window on Friday night (Nov. 17). The mission emblem for SpaceX's launch of the secret Zuma payload on Nov. 16, 2017. 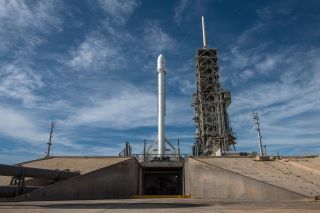 We know few details about the Zuma launch, and what little we do know comes from a representative with Northrop Grumman, the aerospace company that arranged the payload's launch for the U.S. government on a SpaceX Falcon 9 rocket. According to Lon Rains, communications director for Northrop Grumman's space systems division, Zuma will be launched into a low-Earth orbit. "The Zuma payload is a restricted payload." Rains said in a statement. "Northrop Grumman is proud to be part of the Zuma launch. The event represents a cost-effective approach to space access for government missions." According to a mission description posted online Wednesday (Nov. 15), SpaceX will attempt to land the first stage of the Falcon 9 rocket used in tonight's launch at Landing Zone 1, a pad at the Cape Canaveral Air Force Station near the company's Pad 39A launch site. That landing should occur about 7 minutes and 51 seconds after liftoff, SpaceX representatives wrote. The Zuma launch will mark SpaceX's 17th mission of 2017 and the company's third classified flight this year. In May, SpaceX launched the NROL-76 spy satellite for the National Reconnaissance Office and followed that with the Sept. 7 launch of an uncrewed X-37B space plane on the OTV-5 mission for the U.S. Air Force.